One of the laudable characters of human culture is our gift to produce a lot of material things, not only that we create and consume them, we particularly attach awe-inspiring at times odd meanings to it. The bicycle for example is just one of the many artifacts of human culture that has endured and has enjoyed the reception of many since its inception way back in 1860’s – that was when the term bicycle was first coined in France. This quaint and simple mode of transportation maybe catalogued as a leisure pursuit these days but it actually has a long, rich and blissful history and I’m just amazed to think about how a dandy-horse or a draisine as what it was first called in Germany has evolved and now has varying trends and has a particular persona for each of the unique make coming out for human utilization. The evolution of the use of bicycle also has come along with the advancement of our civilization, while it was a major mode of transport back in the early times of the Duke and the Dutchess, today it still has remain as a major mode of transportation but only for those who want to stay fit and healthy or for those who have a pressing ecologic advocacy. Today, there are now countless variations of the then simple and charming draisine, this online bicycle store for instance, carries all sort of bicycles and accessories one can customized to his or her own fittings – your choice of material and build suited to a place where you’ll journey with it. Few of the makes I find so much meaning and sensation with are bicycles like posted above – they’re called the vintage ladies bike, if you happen to live down under, you can check out this ladies bikes Australia site for various designs and pricing. 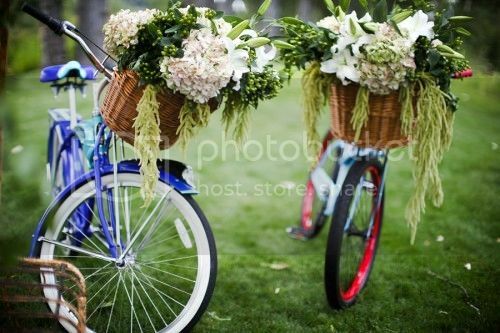 So going back to what I said, there’s really something grand and some sort of a romantic fondness to this make, probably because this is readied particularly for women, or it’s because this is one of the most photographed kind of bicycle that I attached romance to it. If you’re a hopeless romantic being like me, I think you’ll find warmth, sincerity and romance with this kind of vintage stuff all adorned with a bunch of lilacs and a bottle of wine tucked in a basket and pegged at a tattered doorway. Or maybe it’s just the photographer that’s so dexterous finding a romantic angle out of this antiquated-styled velocipede. But for whatever it is, this artifact simply has a touch in my psyche for what I call my ‘vintage bicycle romance’. Gotta love that beach cruiser vintage bike right there, we have 3 bikes and one of them definitely needs a basket like that in the front. Riding bike always freaks me out :-( I really need my balance especially riding near the creek :-( My family loves to bike though I need a new one. Biking is a wonderful exercise. love those bikes :D it's been awhile that i haven't bike and i'm not sure if i still knows how to ride on it. those photos looks romantic indeed, especially with those flowers in a baskets. Don't you know that it is my dream to own such bike? I am really looking to buy one and still searching for the right one for me. Those one you've shown are perfectly accessorized. I remember when i was in grade school, i was grade one i think, my father would take me to school on his bicycle which was our mode of transportation back then. I miss biking especially that it will help my body exercise from my sedentary lifestyle. waaaa. i so love vintage stuff, even my mom in law gave me her bike that she used 20 years ago and it's still durable. The first bike that we have and the one my older brothers and sisters used to teach me back then was a yellow beach cruiser bike and I like it. Maybe when I can find a nice one and fits my budget, I'd probably go for it again.